Today on the YarnThing Podcast with Marly Bird: Red Barn Yarn’s Catherine! Listen in below to hear Marly and Catherine talk about how Catherine started her business, Red Barn Yarn, choosing yarn colors, trade shows, getting her yarn in publications, and more! 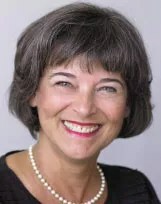 Catherine Petitti; owner, operator, designer, and artist of Red Barn Yarn, learned to knit and sew when she was young. As she was rather small for her age, she needed to be able to make age-appropriate clothing so learned out of necessity. Catherine always wanted to own her own business and she did out of college, a fabric store. After marriage, kids, other jobs, and moving around the country, Catherine got back into knitting. She began hand dying yarn in 2008 which she pitched to yarn shops. 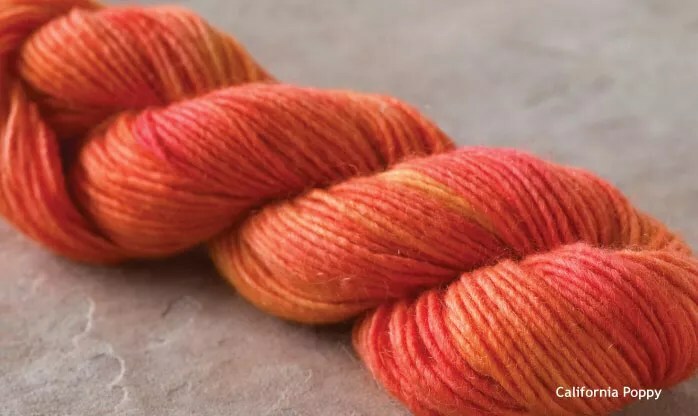 When they really started buying and selling her yarn, Catherine developed her website for Red Barn Yarn and began going to the TNNA trade shows. Now, Red Barn does pattern development for the yarn and participates in the TNNA fashion shows. Today, Red Barn Yarn works in 30 different base yarns and has about 75 production colors. Catherine specializes in tonal solids and coordinating variegated combinations of color that truly delight the eye. Some examples below! You can find Catherine and Red Barn Yarn on: the website Redbarnyarn.com, Ravelry, Facebook, and Twitter. And we can’t forget the Giveaway!! 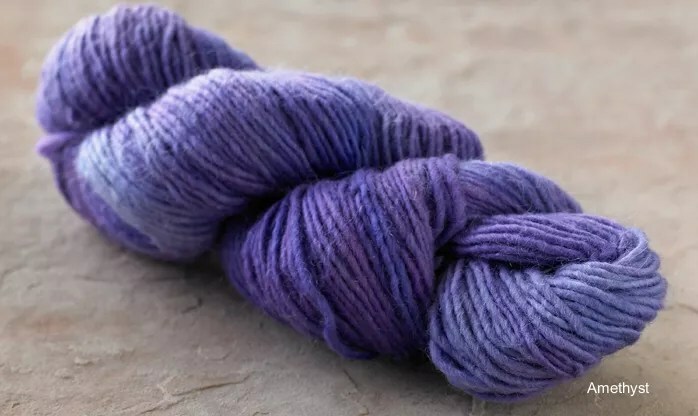 As Marly said, the comment prize is one skein of Red Barn Yarn’s Llama Sparkle in the Amethyst colorway (shown above) as well as a pattern for a one-skein shawl! Leave a comment below with Catherine’s keyword for your chance to win!! Would be awesome for this grandmother to make a something special for her grandson using Red Barn Yarn. My grandmother’s cousin taught me to crochet when I was 7 and my grandmother tried to teach me to knit as well. Unfortunately the knitting didn’t stick until last March when I took a class. I would love win a skein of Red Barn Yarn! I am going to have to find my way to NYC and the local stockist so that I can knit a one skein shawl. My Grandmother thinks shawls are for old people, and she sure as heck isn’t old! LOL If I’m half the little old lady she is, I’ll be doing great. My grandmother was an avid knitter. She couldn’t read instructions so looked at pictures and figured things out. I love the podcast Marly! I have crocheted for a long time and finally learned to knit a few years ago at a LYS. Unfortunately, I didn’t have anyone in the family that knew how to knit, not even my grandmother! I hope I will be able to teach my love of yarn and yarn crafts to my grandchildren someday! Too bad that my grandmother never had yarn like this to knit with! My story could be a billion other stories. 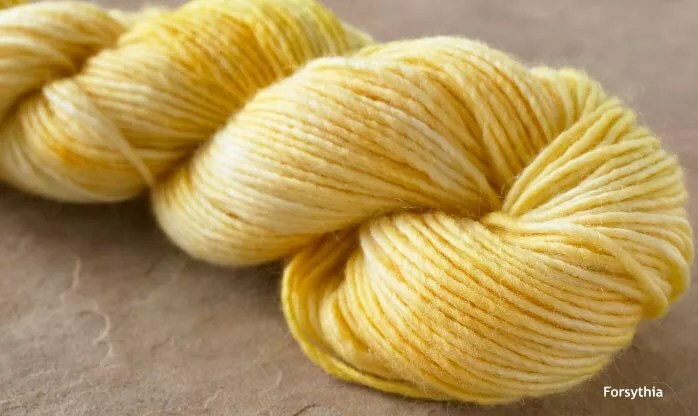 My grandmother knit and crocheted in the late 60s early 70s and tried to teach me, I was left handed couldn’t quite grasp it, forced myself to learn in 3rd grade and blah blah blah… But Grandmom never had yarns like Red Barn Yarns and other hand dyed beauties. Thanks again for a great interview. I never miss a show! My grandmother taught me to knit. That is when I really knew that I loved this craft. I learned recently that my grandmother crocheted. I remember seeing doilies around her apartment but never knew she made them. My grandmother was not a knitter, but her birthstone was amethyst. so there’s a connection there somewhere! Love that color, by the way. My grandmother, Nanny, taught me how to crochet. Whe would LOVE your podcast and Catherine’s yarn! I love being a grandmother. Very inspiring and enjoy all the colors of Red Barn yarns. My grandmother taught me several crafts, but knitting was *not* one of them. Marly, thanks for introducing us to yet another wonderful indie designer! Although my grandmother was a woman of many talents knitting and crochet was not one of them…. I had to learn those on my own. I miss her dearly and wish I could share those with her she would be so proud. I honestly don’t remember which Grandmother taught me to knit and crochet but I have to thank her for it. I love trying out new yarns and shawls are definitely my favorite knitting projects. My grandmother didn’t think I would sit still long enough to learn to knit or crochet–my brother learned though! My grandmother taught me to knit and crochet many years ago. I’m glad she did because now I can really appreciate all the great yarns available these days. I recently taught myself to knit and love your podcast!! I love listening on my way home from a long day in the office. I love learning about artisans! My grandmother never got the chance to teach me to knit due to surgery on her hands, but I think she would be tickled to know I have finally learned! My grandmother taught me to crochet at a young age, I used to make clothes for my barbie dolls. Then I stopped for a long time, now I knit and I learned it from the internet. I am now a bicrafter. I don’t know if my grandmother on either side knitted, although one was a professional seamstress before giving it up to raise her family. One of my grandma’s crocheted and sewed and my other grandma crocheted, knitted, quilted, sewed very well and was a tailor for soldiers during WWII helping to make their dress uniforms fit well. I love that you named one of your yarns for your grandmother. About a month or so ago, my family got together and my grandmother was trying to teach my little cousin, who is left handed, to crochet and she found out I knew how to crochet left handed, I was enlisted to help my eager cousin. It was lots of fun to have us all working on our handiwork together. My grandmother recently passed away and left me her sewing machine, as well as a wonderful crafting heritage. She never did much knitting, but always admired and encouraged me to knit and make beautiful things. I’m a grandmother and my grandsons have learned to knit in school. The fifth grader is making a pair of socks this year and appreciates it all the more when I make him socks. I enjoyed the interview with Red Barn’s Catherine and admire her yarns. I had one grandmother who crocheted a little and one grandmother who knit like the wind. Unfortunately we didn’t never lived close to either. My knitterly British grandmother often sent knitting needles to me as birthday gifts and women’s magazines that had great knitting patterns in them. We also had yarn color cards so we could order the yarn through her and know what we were getting. This was in the late 60’s when I don’t think there were many yarn stores in the States. 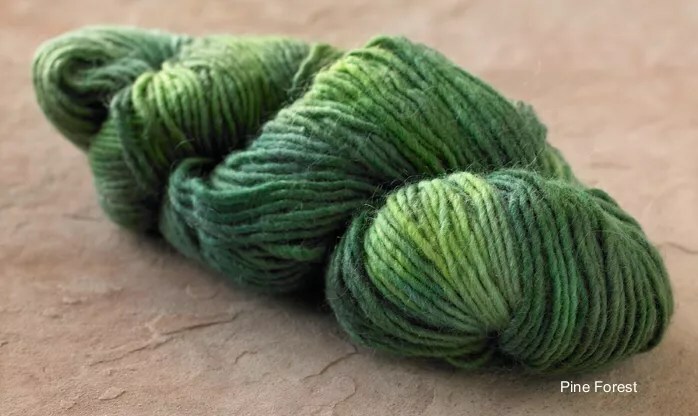 My grandmother let me do yarn dyeing experiments in her kitchen, but my yarn wasn’t nearly as pretty as that Llama Sparkle yarn. My Grandmother, Beatrice, would be proud of my knitting now, as she was the one to teach me. I would love to try some of the sparkle yarn from Red Barn Yarn. Oh my gosh such gorgeous yarn!! Wonderful podcast as always!! My grandmother gave me all her knitting needles as she doesn’t knit anymore. I love using them as they make me think of her and all the things she made with them. Thank you for the chance to win some gorgeous yarn from Red Barn Yarn! I have few memories of my grandmother, but like Catherine she was quite a seamstress. I didn’t get those genes! But I got yarn genes from somewhere.